English Party 1 Student's Book English Party - an exciting new four-level course for primary school children. Written by Günter Gerngross and Herbert Puchta, authors of the international bestseller Join In , more..
English Party 1 Activity Book English Party - an exciting new four-level course for primary school children. Written by Günter Gerngross and Herbert Puchta, authors of the international bestseller Join In , more..
English Party 1 Teacher's Book English Party - an exciting new four-level course for primary school children. Written by Günter Gerngross and Herbert Puchta, authors of the international bestseller more..
English Party 1 Flashcards Topics included: -Friends -Colours -School -The body -Animals -Fruit and vegetables -Food -Clothes -Seasons -Festivities -Actions -Pets -Toys more..
English Party 1 CD audio . The CD audio contains fun and motivating songs and rhymes , ideal for improving pronunciation and developing natural intonation. more..
English Party 1 Culture Posters - 2 full-colour posters Topics included: -Let's go to school more..
English Party 2 Student's Book English Party - an exciting new four-level course for primary school children. Written by Günter Gerngross and Herbert Puchta, authors of the international bestseller more..
English Party 2 Activity Book English Party - an exciting new four-level course for primary school children. Written by Günter Gerngross and Herbert Puchta, authors of the international bestseller more..
English Party 2 Teacher's Book English Party - an exciting new four-level course for primary school children. Written by Günter Gerngross and Herbert Puchta,...more..
English Party 2 Flashcards Topics included: -Specials -Food -Clothes -At the seaside -School -Actions -Festivities -Play Gunter...more..
English Party 2 CD audio . The CD audio contains fun and motivating songs and rhymes , ideal for improving pronunciation and developing natural intonation. more..
English Party 2 Culture Posters - 2 full-colour posters Topics included: -Hurry up, Father Christmas! more..
English Party 3 Student's Book English Party - an exciting new four-level course for primary school children. Written by Günter Gerngross and Herbert Puchta, authors...more..
English Party 3 Activity Book English Party - an exciting new four-level course for primary school children. Written by Günter Gerngross and Herbert Puchta, authors...more..
English Party - an exciting new four-level course for primary school children. 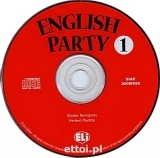 Written by Günter Gerngross and Herbert Puchta, authors of the international bestseller Join In , English Party reflects the latest research in the field of...more..
English Party 3 2xCD audio . The CDs audio contains fun and motivating songs and rhymes , ideal for improving pronunciation and developing...more..
English Party 4 Student's Book English Party - an exciting new four-level course for primary school children. Written by Günter Gerngross and Herbert Puchta, authors...more..
English Party 4 Activity Book English Party - an exciting new four-level course for primary school children. Written by Günter Gerngross and Herbert Puchta, authors...more..
English Party 4 - 2xCD audio . The CD's contains fun and motivating songs and rhymes , ideal for improving pronunciation and developing...more..